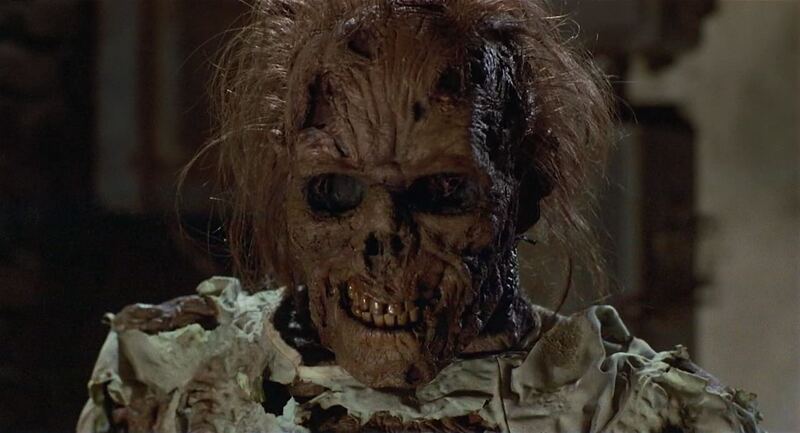 « PIECES (1982) – The Dungeon Review! I don’t know where to begin with this movie. Oh yes I do; I LOVE this flick!! This is one of those quintessential flicks from the 80’s that if you haven’t seen it or if you don’t own it then your DVD collection is incomplete. 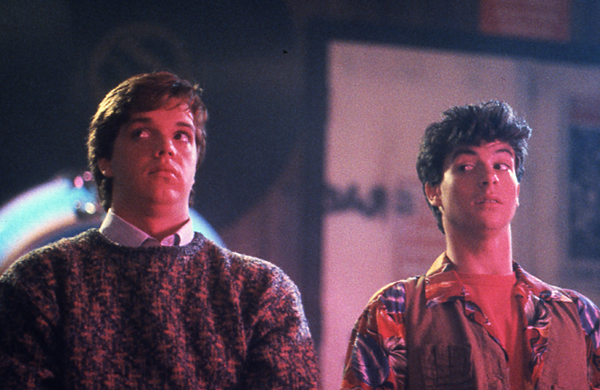 Is this the best genre flick of the 80’s? Of course not. But writer-director Fred Dekker creates a really scary, funny, mixed-genre flick that is just a whole lot of fun. The story starts in space. That’s right, in space. We see two ridiculously funny looking, large-assed aliens chasing a third who stole some kind of “space experiment”. The rogue alien jettisons the experiment out into space and it falls to earth circa 1959. Admittedly the aliens are some of the most retarded looking creatures ever put on film. They are obviously three kids, or midgets, running around in cheap looking rubber suits that are worthy of a Mystery Science Theater 3000 episode. Luckily the sequence lasts only a couple minutes. It’s an interesting way to start off the film, and even back in 1986 when I first saw this (at the ripe age of 16) I remember thinking that the aliens were cheesy. The rest of the opening takes place in 1959 at the local college in black and white. I thought it was a great touch filming the 1959 sequence in B&W. It really helped set the tone. So now we meet some of the characters: a heart-broken cop, his ex-girlfriend, her new beau, and … a serial killer. The scene builds to the inevitable confrontation and then finally we get the beginning credits. During the credits we flash forward to 1986 at the same college, and now the film is in color. We follow around two geek-nerd-dorks (they fulfill the requirements of all three classifications) as they try and assimilate into college life. Chris and C.J. are your typical awkward freshmen. Played by Jason Lively (who later went on to play “Rusty” in European Vacation) and Steve Marshall, the casting here is fantastic. There is nothing remarkable about either one of them (in fact, J.C. is on permanent crutches) and there’s nothing about them that screams out “here’s the films heroes.” Trying to impress a girl waaaayyyy out of his league, the two need to join a fraternity to impress her. Their first acting of hazing? They need to steal a corpse and dump it on the doorsteps of a rival frat house. So they wander over to their friendly neighborhood morgue and find the body of one of the opening characters whose been cryo-genetically frozen. It seems that when he found the crashed space capsule back in 1959 it was full of alien brain parasites and one of them jumped into his mouth. So like in any good B-grade sci-fi flick, his body was frozen so he could be studied. It’s this simple act of hazing that unleashes the parasites. All hell breaks loose on campus as our two geeky heroes team up with a suicidal, tough-guy cop and a bimbo sorority girl to stop the spread of these parasites. That’s right folks; in this flick we get space creatures, alien brain parasites, serial killers, and … zombies!! What more could you ask for in a flick?? Oh yeah; let’s not forget about The Bradster!!! This is an overall great flick that suffers only from some cheap looking f/x as a result of the year/decade it was made in. Good horror-comedy hybrids are almost impossible to find, and this one is the best. Dekker merges the sci-fi, horror, comedy, and thriller genres into one seamless movie that you will watch over and over again. And if you’re like me and grew up watching the crappy re-shot ending, you’ll be happy to know that the DVD contains the ending that Dekker originally intended for the flick … and it’s GREAT. Don’t miss this one folks!!! This entry was posted on January 14, 2010 at 8:21 am and is filed under horror, movies, USA with tags fred dekker, jason lively, jill whitlow, steve marshall, tom atkins. You can follow any responses to this entry through the RSS 2.0 feed. You can leave a response, or trackback from your own site. I just picked this up on DVD but haven’t gotten around to watching it yet. It waits patiently for me to crack it open and check out all the shiny special features. I’m sure the last time I saw this would have been when it first came out so it will be good to revisit something that I just can’t remember. Like watching it for the first time all over again. 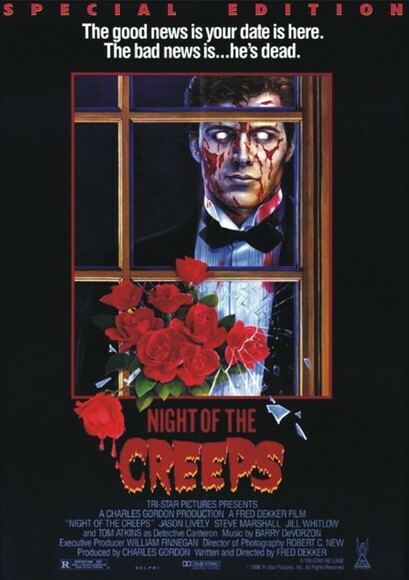 I haven’t seen ‘Night Of The Creeps’ in quite a while myself! I’ll have to look for a DVD copy with the proper ending! where’s the LOVE button for this write up??? haha! Sadly, Scott started his own blog! ‘Sadly’, only because he isn’t contributing to my blog anymore…. Anything Horror.